Not to be confused with AYAKASHI. 妖隠し -あやかしかくし-'s pop'n music banner. 妖隠し -あやかしかくし- is a remix of ネクロファンタジア, Phantasm stage boss theme of the Touhou Project game 東方妖々夢 ～ Perfect Cherry Blossom. The ノスタルジア series use a slightly rearranged, longer version of 妖隠し -あやかしかくし-. 妖隠し -あやかしかくし- was added to beatmania IIDX 22 PENDUAL, BeatStream, DanceDanceRevolution (2014), jubeat prop, pop'n music ラピストリア, REFLEC BEAT groovin'!! Upper, and SOUND VOLTEX III GRAVITY WARS on May 14th, 2015 as part of the BEMANI×TOHO project REITAISAI 2015 event. In beatmania IIDX 22 PENDUAL, it can be unlocked by playing the game once. In BeatStream, it could be unlocked by playing seven Touhou Project songs and then receiving a mail in Takahashi-san Lab. with one of the song's charts. As of December 3rd, 2015, it has been unlocked by default. In DanceDanceRevolution (2014), it is available in the EXTRA ATTACK folder on the EXTRA STAGE. Note that the SURVIVED BONUS meter has to be filled on BEGINNER, then BASIC, DIFFICULT, and then finally EXPERT. In DanceDanceRevolution A, 妖隠し -あやかしかくし- is available by default for all players since June 13th, 2016. In jubeat prop, it was originally available as a BONUS MUSIC, and could be unlocked by playing it once from May 14th, 2015 to May 28th, 2015, after unlocking ほおずき程度には赤い頭髪. It can be unlocked again as a WEEKLY BONUS MUSIC from May 28th, 2015 onwards. In pop'n music ラピストリア, it can be unlocked by playing Struggle, Russian Caravan Rhapsody and 千年ノ理. From pop'n music éclale onwards, 妖隠し -あやかしかくし- is playable by default. In REFLEC BEAT groovin'!! Upper, it can be unlocked by playing ten BEMANI×TOHO songs using any BEMANI×TOHO icon (note that you must have previously unlocked 竹取飛翔 ～ Lunatic Princess (Ryu☆Remix) to unlock 妖隠し -あやかしかくし-). In SOUND VOLTEX III GRAVITY WARS, it's available by default. 妖隠し -あやかしかくし- marks Sayuri Anpo's first appearance in the beatmania IIDX, jubeat, and pop'n music series. 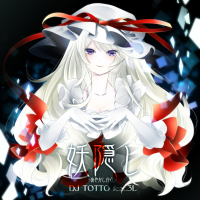 In pop'n music, instead of displaying its character's portrait, 妖隠し -あやかしかくし- displays its jacket (with the BEMANI×東方Project Ultimate MasterPieces logo) on the songwheel. Touhou Project character Yukari Yakumo appears on 妖隠し -あやかしかくし-'s jacket. 妖隠し -あやかしかくし-'s video was added to DanceDanceRevolution (2014) on June 9th, 2015. 妖隠し -あやかしかくし-'s video is full-screen and eliminates any on-screen dancers. 妖隠し -あやかしかくし- is currently the song with the lowest constant BPM in the arcade REFLEC BEAT titles and the BeatStream series. 妖隠し -あやかしかくし-'s BEAST chart was re-rated in BeatStream アニムトライヴ on January 13th, 2016. 妖隠し -あやかしかくし- was added to the pop'n music TV・J-ポップ category in pop'n music éclale on May 31st, 2016. After being removed from the initial release of REFLEC BEAT 悠久のリフレシア, 妖隠し -あやかしかくし- was revived on April 27th, 2017. 妖隠し -あやかしかくし-'s EX chart was re-rated in pop'n music うさぎと猫と少年の夢 on December 19th, 2017. 妖隠し -あやかしかくし- was added to ノスタルジア FORTE on May 3rd, 2018. SOUND VOLTEX BOOTH to III GRAVITY WARS difficulty rated from 1 to 16, and 1 to 20 from IV HEAVENLY HAVEN onwards.